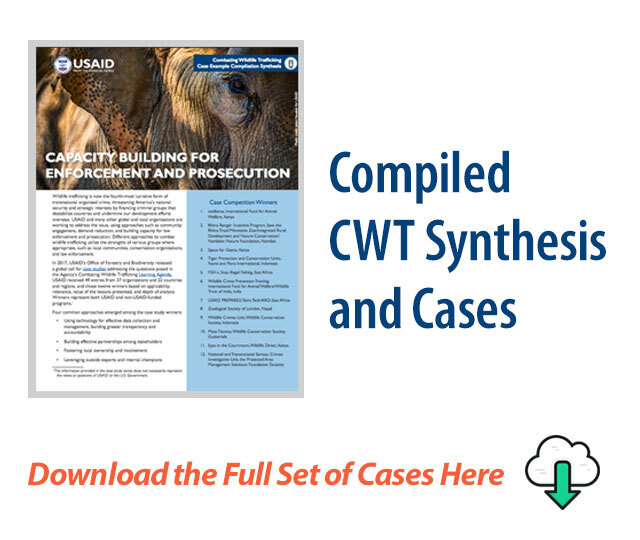 USAID launched a global case study compilation to collect lessons on an urgent global conservation challenge: how to build capacity for enforcement and prosecution to combat wildlife trafficking. Forty-eight entries were received, and 12 of these were selected for publication here. These cases illustrate the great work that is being done across the globe to combat wildlife trafficking, but importantly, they also provide insight into ways in which other efforts to combat wildlife crime can be improved for bigger impact. Summary: Looking across the 12 cases, this synthesis identifies common approaches and explores generalizable lessons. The approaches include: using technology for effective data collection and management, building effective partnerships among stakeholders, fostering local ownership and involvement, and leveraging outside experts and internal champions. Summary: In Nepal, the Zoological Society of London works to build and strengthen enforcement capacity and coordination to combat wildlife trafficking through a series of nested partnerships with government, non-governmental organizations, and local communities. This approach supports targeted policy interventions and innovative conservation technology as well as the development of Community-Based Anti-Poaching Units, anti-poaching Rapid Response Units, and the SMART approach. Summary: Wildlife Conservation Society’s Wildlife Crimes Unit takes a unique approach to combat wildlife trafficking in Indonesia. The Unit performs intelligence work, assists law enforcement, helps build capacity for combating wildlife trafficking among law enforcement officers, and raises public awareness through the media. Since it began operations in 2003, the Unit has supported more than 500 sting operations to arrest more than 600 wildlife trafficking criminals, with a sentencing rate of higher than 90%. Summary: Established in 2015, Mesa Técnica is a partnership among three civil society organizations working to build capacity for wildlife trafficking enforcement in the northern Guatemalan department of Petén. Select personnel from partner institutions sit on a close-knit committee dedicated to pursuing investigations into potential wildlife trafficking offenses. The committee works in coordination with the relevant law enforcement authorities and collaborates to deliver specialized training workshops to build government and civil society capacity to combat wildlife trafficking. Summary: Even when apprehended, few poachers or traffickers in Kenya and across East Africa are actually prosecuted. While in her previous position at the U.K. Foreign and Commonwealth Office, Space for Giants worked to strengthen criminal justice system through development of (1) a Rapid Reference Guide for use by prosecutors and judges, (2) Criminal Procedure Rules to overcome court delays, and (3) draft sentencing guidelines to ensure sentencing proportionality and consistency. Summary: The USAID PREPARED project addresses the need to improve data collection and use in protected areas in East Africa. PREPARED formed a partnership with a range of stakeholders who articulated their needs for technology to improve the collection and use of wildlife data which informed the design and testing of the WILD application. This comprehensive, off-the-shelf data collection and reporting tool is now used by rangers of different literacy levels as they implement anti-poaching initiatives in the landscapes of East Africa. Summary: Tanzania’s PAMS Foundation has worked alongside the National and Transnational Serious Crimes Investigative Unit since 2014 to combat wildlife trafficking and poaching. With guidance and capacity building support from the foundation, the Unit has become one of the most effective and recognized counter-trafficking teams in Africa, having completely changed the game and gained an advantage over notorious wildlife crime syndicates in Tanzania. Summary: Wildlife Crime Prevention Training is a capacity building training program designed to enable frontline forest guards across India to understand and deal with wildlife crime in their areas of work. The course is designed for forest guides to understand (1) the wildlife crime scenario in their geographical area, (2) the methods and techniques of various criminal gangs, (3) the provisions of the Wildlife Protection Act of 1972 and powers vested in them under the Act; and (4) the investigation and documentation of wildlife offenses at the ground level. Summary: tenBoma is a wildlife security initiative that identifies, anticipates, and counters threats to wildlife by applying predictive methodologies to determine when and where wildlife crime events are likely to occur. The initiative builds capacity of both local law enforcement and communities to (1) deny safe haven to wildlife criminals, (2) increase community security, and (3) reveal the organized criminal networks involved in illegal wildlife trade. Data are continually collected in the field, aggregated with existing reports, and analyzed by security experts. Summary: Established in 2012, FISH-i created an informal network that shares information and intelligence through a shared communications platform. This regional cooperation, coupled with dedicated data analysis and technical expertise, has catalyzed enforcement actions and created transparency to challenge corruption. Sharing real-time vessel data and accessing satellite tracking expertise enables authorities to identify and act against illegal operators and will ultimately contribute to the end of illegal fishing in the Western Indian Ocean. Summary: Since 2000, Fauna & Flora International has collaborated with park officials, communities, police, the judiciary, and local government to pioneer effective tiger protection strategies. Tiger Protection and Conservation Units, led by park officials alongside community rangers, conduct routine and information-led patrols and investigations. Project efforts have led to effective law enforcement to safeguard tigers against surging international demand, securing a stable tiger density in the core of the park. Summary: Eyes in the Courtroom is a public-private partnership that monitors, tracks, and analyzes outcomes of wildlife crime trials in all 121 courts in Kenya. The analysis of these trials has provided a performance measure of the investigation, prosecution, and disposition of wildlife crime cases. This analysis assists Kenya’s policy makers in guiding policy and institutional reforms by identifying priority areas across the wildlife crime justice chain that need attention. Summary: Effective solutions to poaching require a context-specific, stakeholder-driven mix of top-down and bottom-up strategies. The Conservancy Rhino Ranger Incentive Program seeks to demonstrate how partnerships that explicitly incorporate local values and institutions are a foundation for combating poaching. This case study illustrates how coupling a locally devised rhino monitoring system with tourism partnerships can increase the value local people attach to saving rhinos, resulting in both formal and informal community enforcement.